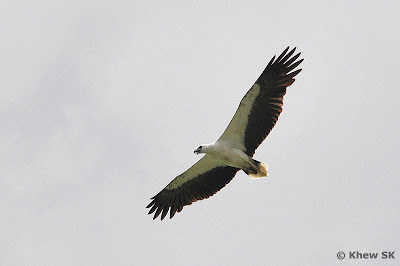 A healthy White Bellied Sea Eagle soaring in the skies. This was shot at a Reservoir Park. I was taking a good rest at home on this Easter Sunday, after a tiring marathon out in the field shooting butterflies the previous two days, when I received a text message from ButterflyCircle member Chng CK. Whilst out shooting with Loke PF, they had come across an injured eagle that some fishermen had pointed them to. 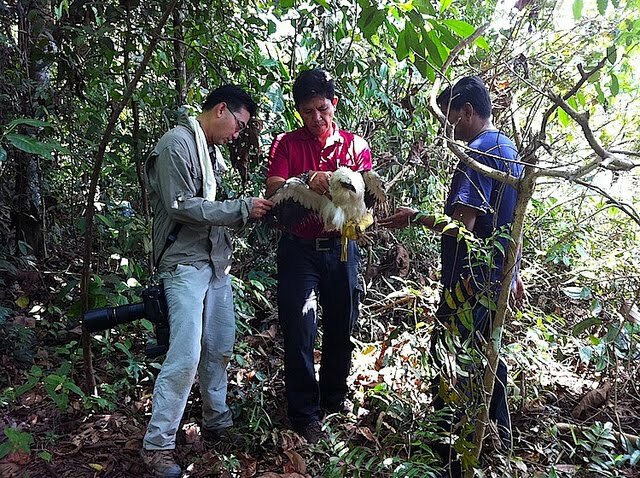 As we were all inexperienced at handling birds, and particularly one as big as this bird of prey, I advised Chng and Loke to leave it where it was, just in case the bird panicked and injured itself further, or even injured them! After a few quick SMSs to friends and nature enthusiasts, I received a reply from Biswajit Guha, the Director of Zoology at the Singapore Zoo. Bis had conveyed our SOS to the General Curator of the Jurong Bird Park, Mr Raja Segran. 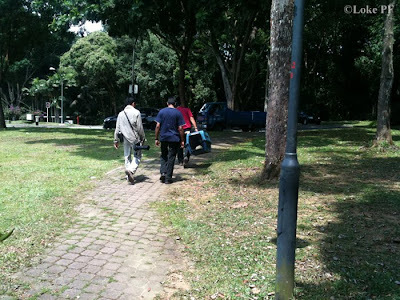 After a few SMS exchanges, Raja headed out to the location where Chng and Loke were waiting with the injured bird. 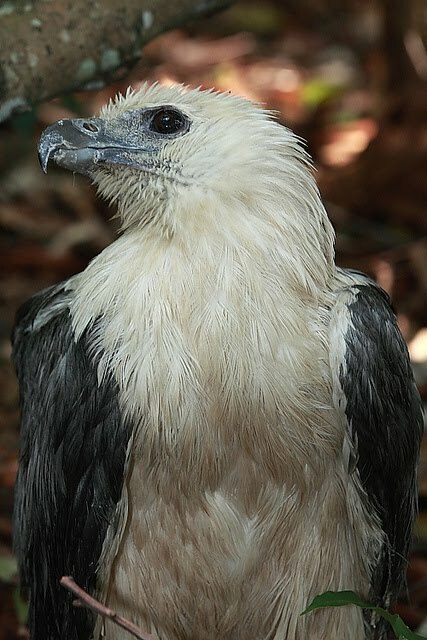 He identified the eagle as a mature White Bellied Sea Eagle that appeared badly injured. In the meantime, Loke kept watch over the bird to ensure that it did not fall prey to any predators that may be lurking around the forest. 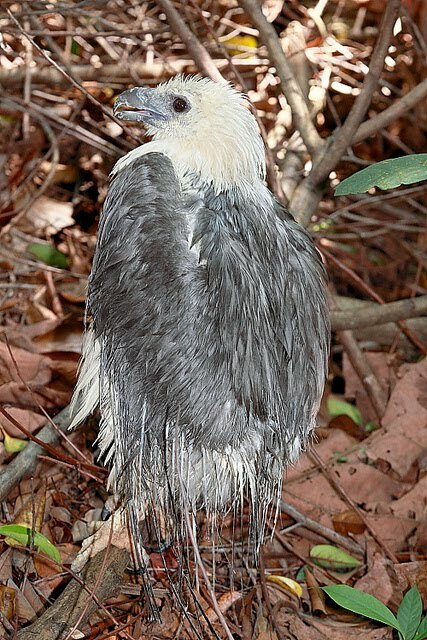 The traumatised bird was in a bad state, with its tail feathers completely torn off. 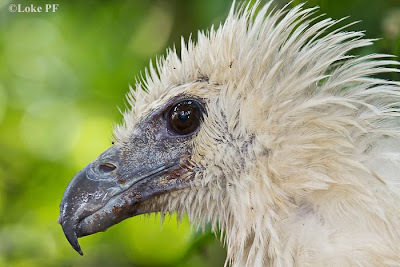 Its right eye appeared opaque and it was obviously blind on that side. 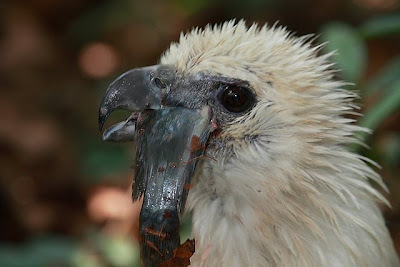 Keeping a safe distance, our ButterflyCircle members took photos of the bird for record, as this was the first them either of them was this close to this magnificent bird of prey to be able to shoot it at macro range! We had just been shooting the White Bellied Sea Eagle the week before, when a couple of them swooped low enough for decent shots with our Tamron 180mm macro lenses! The bird appeared weak and even though it flapped its wings occasionally, it was unable to fly. One of the fishermen gave our members a catfish, and this was thrown to the injured bird. After a few tries, the eagle ate the fish hungrily, finishing the meal in its usual predator style. After about an hour, Raja and an assistant arrived at the location and with expert handling, captured the injured eagle and wrapped it in a towel so that it would not further injure itself or the handlers. The bird was too weak to put up much of a fight. 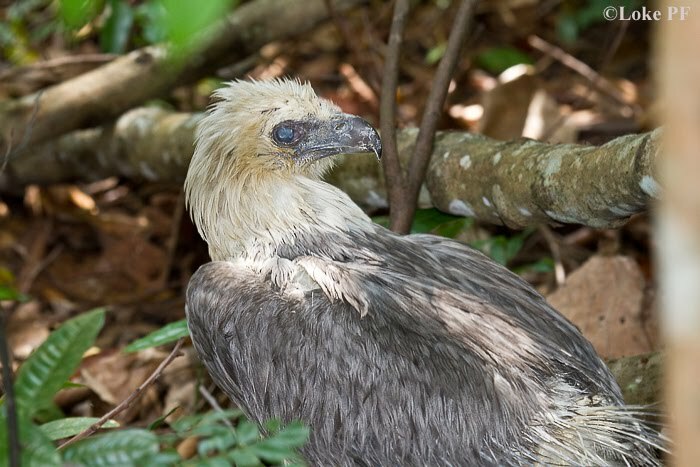 From the condition of the eagle, Raja opined that it was probably kept by some poachers in a cage for some time and dumped in the forest to die, when the owner saw that it was in a condition that it was unlikely to survive for long. 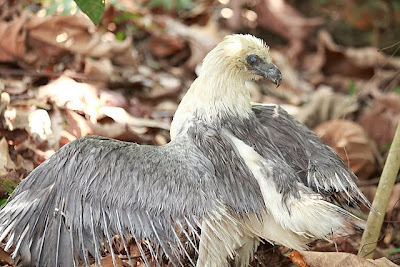 Putting the eagle safely into a kitty box, Raja and his assistant brought it back to the Jurong Bird Park where the injured eagle could be examined and its injuries treated. 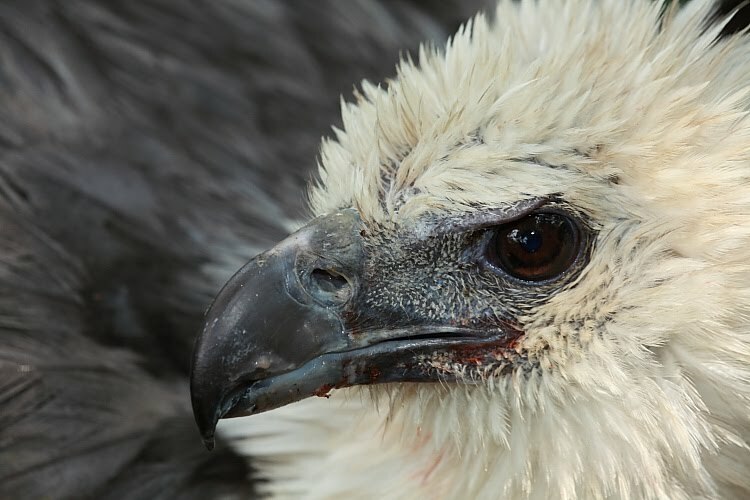 Hopefully the eagle can recover and soar with the wind beneath its wings once again. The eagle, safe and sound in a kitty box, and off to the "hospital" for treatment! 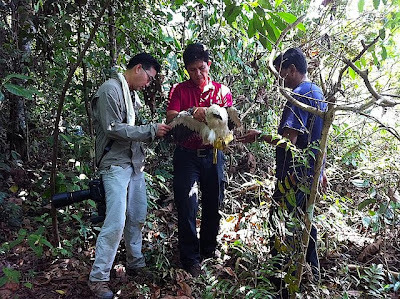 An update a week later when Loke contacted Raja at the Bird Park. Raja said that the eagle is still alive and recovering from its injuries, but is blind on one side as the eye was permanently damaged. 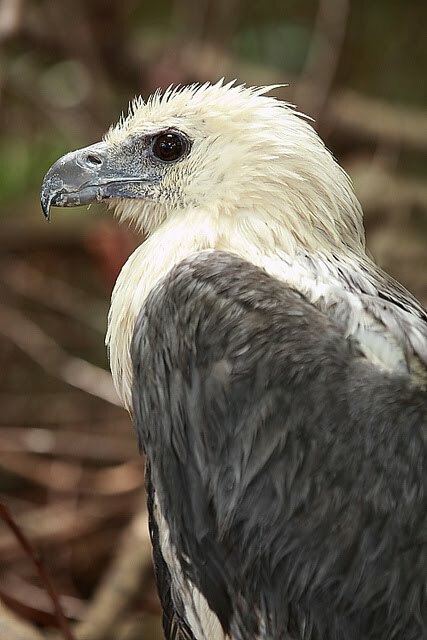 The Bird Park will continue to do its best to treat the eagle, but given its severe injuries when it was found, it may take a long time for the bird to heal. 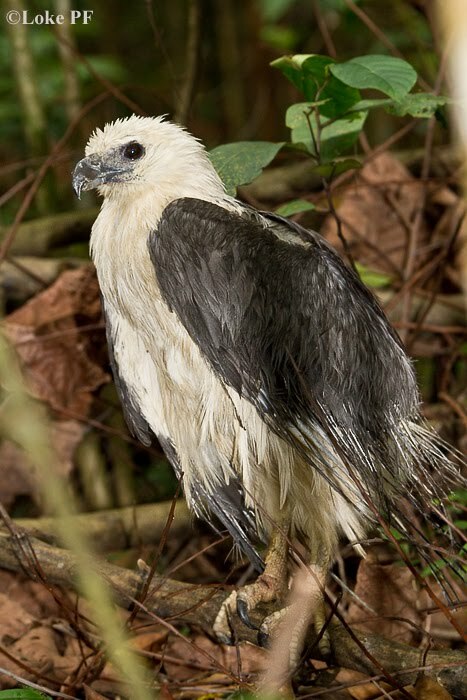 Kudos to Loke and Chng for doing a good deed to try to save the injured White Bellied Sea Eagle, and a feather in the cap for ButterflyCircle's members, whose nature conservation efforts extend beyond just butterflies. Thanks to my friends who responded to my SMSs and offered their advice - Ria Tan, R Subaraj, Serene Chng, Ng Bee Choo, Johnny Wee & Robert Teo. Special thanks to Biswajit Guha of Singapore Zoo and Raja Segran from the Jurong Bird Park for the rescue exercise. This is perfectly alright to post it here as the bird is lucky to meet the butterfly friends. 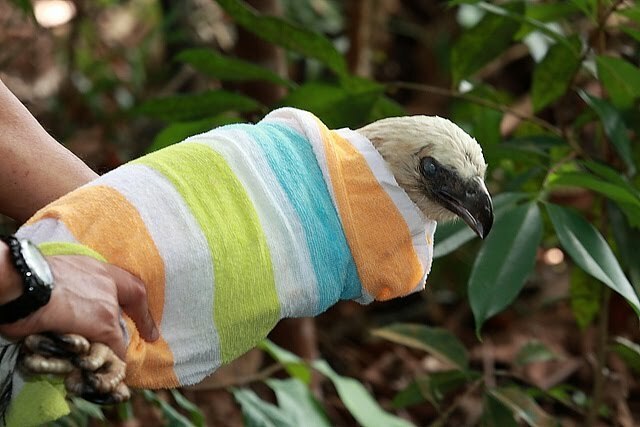 I thank you saving an eagle life! Any new updates on the eagle?